Smoked salmon is a delightful form of a wildly-popular fish. Cured or brined, then salmon is then smoked, the process brings out delicate flavors, which rise to the top and charm the palate. Our newly-minted, officially-Chef Kate has created this Smoked Salmon Strata, which is even more delicious than any photo could convey. The multi-layered flavors of the salmon, in concert with spinach, cheese and ciabatta rests comfortably and elegantly on a bed of balsamic glaze. It is accompanied by the complementary flavors of its garnish, roasted red peppers and avocado. When you make your way to our dining room for breakfast, cross your fingers that Smoked Salmon Strata is on the day’s menu, for it brings so much more to the table (literally) than the average breakfast platter. This unique dish will nourish your soul in ways that no mere scrambled egg can challenge. 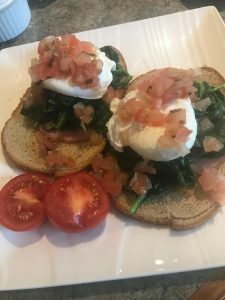 You may wish just to come to Saratoga, to stay at our inn–just for the breakfasts: sleep, eat. Sleep, again. We’re good with that. To find your perfect dates to rest deeply, then refresh with Chef Kate’s world-class cuisine, call us anytime: (518) 584-6751. 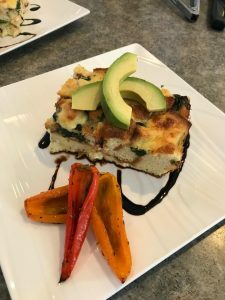 Posted in Brunswick Bed and Breakfast | Comments Off on Chef Kate’s Smoked Salmon Strata: Layers of Flavors. Morning, Done Right.